Week 7 was another fun and exciting week at Camp, highlighted by a variety of fun events. Campers continue to put their talents on display, showcasing their singing, dancing, boxball, basketball, break dancing, beat-box, piano, and “armpit-tooting” skills in talent show performances worthy of America’s Got Talent. Week 7 was highlighted by an incredible week of Tie Dying at Nature. Campers chose from a array of designs, using mostly their Camp Hillard T’s but sometimes bringing in another favorite T. Many shirts were sent home on Friday, with a final batch on Monday, all initially washed, dried, organized, labeled, folded and bagged by Kathleen and her team with follow up instructions for parents included in the bag. Spirit and Sports Cup Week Opening Ceremonies took place on Monday morning. Campers and counselors filed onto the Main Field, all of them broken out into Green and White Teams, to witness the raising of the Green and White flags as Jon Libman declared, “Let the games begin!” Green and White counselor representatives from every tribe participated in a free throw shooting contest, dizzy spins and blindfolded soccer! Competitions continued in earnest throughout the entire week; groups came together and broke out into their respective Green and White Teams for a variety of events, including mini-golf and tennis tournaments, water polo matches at the Pool, as well as intense Baseball, Basketball and Soccer tournaments. Campers continued to work on their American Red Cross swimming skills and are making great progress. In addition to our regular swim program, Junior Campers participated in Green and White Swim Fun, complete with Medal Hunts, swim races and “silly’ jumps! On Friday afternoon, the CIT’s took a short jaunt down to the Candlelight Inn for the Annual CIT Luncheon. CIT’s or Counselors in Training, are the eldest campers at Hillard; all are rising 7th-10th graders who work side by side with General Staff in Group or Specialty Assignments. As a special thank you for all of their hard work, they were treated to a lunch that included the Candlelight Inn’s World-famous chicken wings, a messy and thoroughly delicious reward for a successful summer! On Friday afternoon, when all of the events concluded and the scores were tallied, The Green Team was declared the Victors with 101 points. The scores couldn’t have been much closer; the White Team finished with 95 points! Regardless of the point totals, every camper was filled with a sense of Camp Spirit, pride, and accomplishment for their intense participation, great sportsmanship and Green and White pride! The eighth and final week of Camp is sure to be an exceptional four days of fun. The Big Show is on tap for Monday evening; the Apache and Iroquois Boys and Girls are ready to cut loose in their production of Showtime. Final rehearsals have been in full gear, and the show is sure to be a fantastic one. Tuesday, the long awaited Hillard Carnival will commence. It’s also our final Tribal Color Day and an All Camp Picnic. The Special Camp Show and Charity Presentation are on Wednesday; campers are gearing up to take the stage to perform some of the most notable songs from their Visiting Day performances. The counselors have been furiously preparing for the Annual Counselor Talent Show on Thursday, which is sure to be a lot of fun. On Thursday, we will also have a Moving Up ceremony for all the campers as they step into the shoes of their future tribe; Pawnees to Chickasaws, Hurons to Cheyennes, and so forth! It is sure to be an exciting and memorable week. For more details specific to your child’s group, please read our Weekly Tribal and Program Newsletters which are found in the Enrolled Camp Families section of our website. This entry was posted in Uncategorized on August 11, 2018 by Camp Hillard. Week 6, Week 6!!? It’s hard to believe just how quickly the summer is flying by. The week was highlighted by the Swim Festivals; the South Campus Swim Festival on Tuesday and the Main Complex on Friday. There was music at the pools, treasure hunts, swim races, musical water buckets and more! S’mores Roasts and Ice Cream Parties are in full swing. This week, the Pawnees, the Chickasaw boys, the Huron boys and girls, the Cheyenne boys and girls, Comanche boys and the Cherokee and INA girls all enjoyed their ooey, gooey, sticky-delicious S’mores Roast, while the Comanche girls and their Cherokee and INA boys enjoyed their Tribal Ice Cream Party. Nothing beats a Camp Hillard Ice Cream Party; campers build their very own Ice Cream Sundae, choosing two scoops of ice cream, chocolate or vanilla (or both), assorted tasty toppings like rainbow and chocolate sprinkles, caramel sauce or chocolate syrup and maraschino cherries. An Ice Cream Float is another option; two scoops of ice cream, swimming in fizzy, bubbly Coca Cola. A refreshingly tasty treat on a hot summer day! The week’s Lunch offerings were varied and delicious, as usual. We started the week with A Make Your Own Sandwich meal of assorted cold cuts, cheeses and French fries, followed by Taco Tuesday; Mexi-Beef Tacos with Cheese, salsa and sour cream. Wednesday featured Hillard’s insanely popular Chicken O’s; most campers and counselors will admit to saying, “I’m just going to have one more.” But everyone knows you can never just eat one more Chicken O! Thursday featured a Topsy Turvy Breakfast for lunch: French Toast Strips, Turkey Sausage Tater Tots and Chocolate Milk, and we rounded out the week with a Baked Rotini with mozzarella cheese, mixed green salad and bread sticks! This week, we also saw several nail-biting Sports League Playoff and Championship games. In the Cheyenne Boys Hudson River League, the Golden Lightning played the Swimming Tigers while the Musical Alans took on the Mashed Potatoes. The Golden Lightning and the Musical Alans were victorious in the first round and played each other in the Hudson River League finals with the ­­­­Golden Lightning coming out on top. The East River League saw the Soft Pretzels play the Flying Tigers and the Fire Shark Devils take on the Red Lightning. The Soft Pretzels and the Red Lightning won their respective first round games and had an epic East River League finals matchup with the Scarsdale Soft Pretzels coming out on top. Congratulations to all of the Sports League participants, who all demonstrated good sportsmanship and great Camp spirit. The Pawnees and the Chickasaw Boys and Girls had their Visiting Mornings early in the summer; for many of our youngest campers, Camp may be their first full-day group experience, and moms and dads are eager to meet the counselors and see their little ones in action! This year, the Pawnees and the Chickasaws showcased their developing athletic skills at a Sports Skills Showcase on the Main Field, participating in a mini-obstacle course which included shooting hoops, kicking a soccer ball and scoring a goal at field hockey. On the musical side of things, they performed a few special songs that they had been perfecting for the first few weeks of the summer, including Rubber Ducky, The Rainbow Connection, One Small Voice and the Camp Hillard song. The Visiting Day programs for Hurons and older are a little more intense; in addition to participating in sports and swimming, campers perform a Broadway style show on the big stage. This summer, the Huron Boys and Girls hit the stage for the very first time, performing All Shook Up and Annie! Visiting Day for the Cheyenne Boys and Girls included baseball and softball and swimming at South Campus Pool Complex, which always includes a ride down The Great Green River! The Boys hit the stage to perform their version of All Shook Up and the Girls enjoyed performing in the well-loved, Disney hit, Frozen. Comanches and older are always excited by the prospect of a Visiting Evening. These Tribes get to remain at Camp after every other camper has gotten on their bus and headed home! Dinner is served at South Campus and campers and counselors gear up for an exciting evening! The Comanche Boys and Girls showed off their athletic prowess during games of basketball and soccer, respectively, after which the boys hit the stage to perform The Blues Brothers, while the Girls entered a world magic in the perennial Broadway and Hillard favorite, Wicked. Visiting Evenings for Senior Camp take place towards the end of the summer; campers spend six to seven weeks rehearsing for some very exciting shows; the Cherokee and Navajo girls in Pitch Perfect and Hairspray and The Really Big Show during the final week of Camp. This year, the A-I Boys and Girls are celebrating 90 years of Camp Hillard songs and performances in Showtime! Next week, the fun continues! The excitement is building for the Opening Ceremonies of the Green and White Spirit Week competition. The Opening ceremonies will include a Top Secret Counselor Event; the event is so secret that Directors Jon and Jim Libman are still not privy to the details. It is certain to be memorable! For more details specific to your child’s group, please read our Weekly Tribal Newsletters and Program Newsletters which are found in the Enrolled Camp Families section of our website. Have a great weekend! This entry was posted in Uncategorized on August 4, 2018 by Camp Hillard. The fourth week of Camp was another exciting and successful one! Camp is now in full gear with all of our swim, sports, and arts programs, as well as specialty activities and special events. Campers are in their instructional swim groups, sports leagues are in motion, as are all our regular program areas. Visiting Day programs continued in earnest this week, with the Pawnees, the Chickasaw boys and girls and the Comanche boys. Our 2018 Summer Charity Event began on Monday, July 16. All campers participated in Hillard Hoops for Focus For a Future during their group’s Basketball period during the week. Since its inception in 2003, Focus for a Future, a nonprofit organization, has been working with over 120 top sleep away and day camps to provide opportunities for children to attend summer camp who would not otherwise be able to afford to do so. While the camps, including Camp Hillard, offer full-tuition scholarships to those children identified by Focus for A Future, there are also other expenses such as providing the campers with various supplies and equipment needed for camp. During the summer of 2018, Focus for A Future placed 448 children in summer camps. Focus for A Future is led by Paula and Jack Kaminer, along with a volunteer Board of Directors. Paula and Jack have a long history with camp and education. Among other things, Jack taught for 21 years at Scarsdale High School, where he was also the head basketball coach for many years, becoming a Westchester and New York State Hall of Fame coach. In 2003 they decided to create Focus for A Future. For over 15 years, the work of Focus for A Future has allowed many children to have a camp experience. Many of these campers have also become staff members at their camps, and the experience has clearly made them more self-confident and has helped improve all of the skills needed to become successful students and eventually adults. Camp Hillard is proud to be associated with Focus for A Future and we are very excited to be doing this year’s charity fundraiser with them. All of the money raised will help Focus for A Future to continue as an organization and also to help purchase supplies and equipment that these campers need for camp. In addition, any camper donation of at least $100 per camper will entitle the camper’s family to participate in a raffle for a free summer for 2019. The winner will be announced in the Winter Newsletter, and should the winner be someone not returning to Camp Hillard, they can give the award to a friend who is. Thanks to Camp Hillard families, we have been very successful with our annual charity events over the past 23 years. With your help and generosity, we will make this year’s fundraiser the most successful ever. This week was also highlighted by the Annual Overnight to Brookwood in Glen Spey, New York. This annual trip is reserved solely for the oldest campers, the Iroquois, but this year it was extended to include the Apaches, as well. The campers really look forward to it. We departed from Camp early on Tuesday morning, in order to get in a full day of fun at Brookwood! Despite some heavy rain and thunderstorms on Tuesday, campers and counselors had an amazing time. Indoor activities included, cooking, dance and Broadcasting. Wednesday’s weather was truly spectacular, and campers and counselors were able to take full advantage of a variety of Lakefront activities; everything from kayaking and paddle boating, to water tubing behind a speedboat and the Blob, a giant trampoline-like inflatable that campers could bounce up and down on, splash-landing into the refreshing lake. The food at Brookwood was great; breakfast, lunch and dinner were served daily, and campers had the option of mac and cheese, fresh veggies, chicken nuggets and waffle fries, spaghetti and meatballs, tacos, grilled cheese, and more. In the evening, we enjoyed a bonfire by the lake and a delicious s’mores roast. We had a great full day of activities of Wednesday before saying goodbye to our new friends and making the return trip to Hillard. Speaking of food, can we talk for just a minute about the food at Camp Hillard? It really is pretty fabulous. A great deal of time and thought is put into the Menu planning prior to the Summer Camp Season. Some of the more popular lunch offerings include Hillard’s Famous Cheese Pizza, Nachos Grande with Cheese, crispy Chicken Nuggets, the insanely popular Chicken O’s (think a chicken nugget shaped like a donut), Mexi-Beef Tacos served with Salsa and Sour Cream, Asian-inspired Chicken with broccoli, to name just a few. In addition to the Daily Menu, a variety of substitutes are readily available so as to accommodate all camper’s tastes, preferences and dietary needs. Mid-day snacks and afternoon refreshments are also served daily; Fresh Fruit, Cheese sticks, Goldfish, Graham Crackers, Oreos, and Kettle Cooked Potato Chips are among some of the daily snack options. Ice cream and iced pops are served on an alternating schedule in the afternoon; Twin Pops, Chocolate Eclairs, Firecracker Pops, Ice Cream sandwiches and more. There is no better way to end a busy Camp day than sitting down with friends and enjoying a cool and refreshing treat before boarding the bus to go home. We enjoyed a variety of fun events at the pools this week. Pawnees, Chickasaws and Hurons participated in a tropical Swim Luau on Wednesday; the Main Pool complex was transformed to a Hawaiian paradise of palm trees, pineapples, coconuts and limbo sticks! Campers enjoyed exhilarating rides on the Alligator floats, relaxing floats on the watermelon inner tubes, underwater treasure hunts and more. On Thursday, Middle and Senior Campers took part in Hillard’s Famous Wacky Dive Contest; Cheyennes and older showed off their cannonballs and belly flops for a team of Celebrity judges who provided exciting color commentary during the Event. The boys and girls attending the mini-sleepaways departed on Sunday morning. One again, the boys and the girls will be visiting Camp Pontiac in Copake, New York. Randi and Bruce, the INA girls and Boys Divisional Head Counselors, are very excited about joining the campers on their mini-sleepaway. It is hard to believe that Monday is the start of the second half of the summer season. There are still so many great activities and special events on tap. Our Instructional swim program is in full swing and theater practice continues for Visiting Day and evening performances. Swim races, s’mores roasts and ice cream parties are scheduled for next week, and Thursday is Camp Hillard’s 90th Birthday celebration! There will be a Birthday Dance Party for all Tribes in the Gymnastics Pavilion and retro Tribal games and activities in honor of this momentous occasion! This entry was posted in Uncategorized on July 21, 2018 by Camp Hillard. Monday was Crazy Hat and Hair Day. All of the campers and their counselors wore their best Crazy Hats and Wild Hairdos. The Cheyenne Boys and Girls participated in Boat Races. 2nd year campers also received banners on Monday while 3rd and 4th year campers received commemorative shirts on Tuesday to celebrate their tenure. We took our Group Photos on Tuesday; everyone was looking sharp! Also on Tuesday, the Apache Iroquois boys and girls and the CIT’s headed out to Playland for some thrilling rides and entertaining attractions. We enjoyed the Festival of Fun and an All-Camp Cookout on Wednesday. It was quite a day, highlighted by a multi-media experience at the Creative Arts Center, inflatables on the fields and at the pools, and a arcade and gaga center. On Thursday, 5th year campers attended a special party, enjoyed ice cream cake, and received a Camp Hillard pillow. On Friday, campers who have been here for 6 or more years, celebrated with a special breakfast; pancakes, french toast sticks, tater tots, eggs and turkey sausage. They also received an extra special gift in honor of Camp Hillard’s 90th summer; a Drawstring bag, embazoned with the Camp Hillard logo, along with a classic baseball cap and a Camp Hillard Pop-Socket! Camp Hillard’s Swim Program is off to a great start. All campers have been assessed and placed in their appropriate swim lesson group. The campers have been assessed based the American Red Cross Learn to Swim Program and the Camp Hillard Aquatic Groups by certified Water Safety Instructors. Afternoon swims are for play and fun. Campers swim with their friends and are able to use different pools throughout the week. Many campers enjoy a ride on the water slide, while some have fun playing with rings, beach balls or noodles. The deep water challenge is offered to any Junior Camper that is interested. Once campers have passed the deep water challenge they can use the diving board. Every Cheyenne and Comanche group has taken at least two trips down the “Great Green River,” the water slide located at South Campus. Campers at the Main Complex have also experienced some very exciting special events. Campers participated in the annual Boat Rides, with everyone getting a chance to race across the pool in out inflatable boats. Also, Junior Campers had a great time getting wet at the car Wash, or running across the Arctic-themed inflatable pool float during The Festival of Fun. Music Friday is a huge hit as campers get to listen to tunes as they enjoy afternoon free swim. On the Creative and Performing Arts front, the Creative Arts Staff outdid themselves during Wednesday’s Festival of Fun, creating a colorful and interactive environment where campers did projects, an obstacle course, Zumba, and much more. It was quite the place to be! And so many great projects have already gone home this summer, with many more to come. The Theater staff is busily preparing for their shows. In junior camp, the Huron Girls are enjoying the songs from the classic musical Annie. They are learning that they are “never fully dressed without a smile” and that there’s always “tomorrow.” Meanwhile, the Huron & Cheyenne Boys are learning how to rock & roll in their show Elvis. The Cheyenne Girls are enjoying the songs from Disney’s classic film and new Broadway hit Frozen. In middle camp, the Comanche Boys Theater Club is learning how to have “soul” in The Blues Brothers. On the other hand, the Comanche Girls are learning how to “defy gravity” in Wicked! Finally, in Senior Camp, the Cherokee Girls are having an “Aca-mazing” time with their show Pitch Perfect. In addition to that, the Navajo Girls are learning how to “welcome in the 60’s”, in the Broadway hit, Hairspray! For the big show, the I-A girls as well as the Cherokee &INA Boys, are paying tribute to 90 amazing years of Camp Hillard Theater with the show It’s Showtime! In music, the Pawnees, Chickasaw Girls and Boys are busy getting ready to perform for all of you on visiting day next week! They are learning classic songs from Sesame Street such as Rubber Ducky and The Rainbow Connection as well as, a beautiful song called “One Small Voice”. We are very excited about singing them for Visiting Day. Speaking of Visiting Days and Evenings, the Cherokee Boys enjoyed a very successful Visiting Evening on Wednesday. While Visiting Days are always fun and exciting, there is something extra special about a Visiting Evening; campers get the opportunity to stay after camp has ended, where they get to enjoy a Tribe Dinner at South Campus before family and friends arrive for the evening program. The Cherokee boys showed off their progress at swim before hitting the courts and the hockey rink to showcase their athletic skills. The Comanche Boys are looking forward to another exciting visiting evening on Monday; they will be the first Tribe to hit the stage to perform for their family and friends. The Sports Program is also off to a great start this summer. . The Junior Campers have done a wonderful job playing baseball and softball. They have been working hard on the skills of throwing and catching, hitting live pitches, and running bases. The Cheyenne Boys have also been working on their baseball skills. The boys have learned how to use pitch backs to not only work on their throwing but also their fielding skills. Sports Leagues are in full swing and are going well. Exciting Intra-Tribal competitions take place daily on the hockey rink, the soccer fields and the basketball court, on the baseball and softball diamonds and on the flag football gridiron. This summer at the Gymnastics Pavilion, the will focus on safety, balance, flexibility, and movement and travelling as well as jumps and strength. The main object to at Gymnastics is the safety skills and confidence of our campers. Our campers will learn to use the gym equipment safely having respect for the gym and others while learning essential skills. The equipment used in the gym this summer will be the floor, beam, uneven bars, parallel bars, rings, and the vault. We also have the climbing, parkour course, martial arts equipment, and we will be opening the zip line soon. We have had an exciting and productive three weeks of camp and we look forward to a fun filled summer of learning and growing. Our Annual Charity Event for Focus For A Future begins. The Cherokee and Navajo Boys and Girls will be visiting Powerhouse Studios on Monday. Also an Tuesday, the Apache-Iroquois Boys and Girls leave for their Overnight Trip to Brookwood. There will be lots of excitement at the pools with the Junior Camp Swim Luau on Wednesday and the highly anticipated Crazy Dive Contests for Middle and Senior Camp. This entry was posted in Uncategorized on July 15, 2018 by Camp Hillard. The second week of Camp was just great! On Monday, we had our annual lollipop hunt, divided by Division. Over the weekend, fireworks went off above the Upper Field, dropping lollipop seeds everywhere. When we arrived on Monday morning, campers discovered that lollipops had sprouted and we needed to collect them so we could play ball again! Freshly picked lollipops always taste the best!!!! Campers collected and sorted the lollipops into colors, receiving points for the most pops collected. Congratulations to the Cheyenne A boys, Cheyenne C girls, Comanche B boys, Comanche A girls, Iroquois Girls and Apache-Iroquois boys for being the best lollipop pickers in camp. As a reward they will each receive a super yummy S’mores Roast!!!! On Tuesday, July 3rd, we celebrated Independence Day, Camp Hillard Style! We had a Patriotic Parade of famous Americans, led by Uncle Sam on a tractor, Abraham Lincoln, George Washington and the Statue of Liberty on a Golf Cart, Pocahontas, Betsy Ross and a wide array of athletes, celebrities and American Icons proudly marching down the road to the Main Field. We all stood proudly as the National Anthem was played and the members of the Greenville Fire Department stood silently in Salute of our Grand Old Flag. The Theater Staff got kept the Independence Day spirit going, leading an All Camp Singalong of patriotic part tunes that included This Land Is Your Land and Yankee Doodle Dandy. Jesse Millman got everyone up and moving, as he lead a Party In the U.S.A. Zumbathon to conclude our celebration. Everyone enjoyed a 4th of July lunch in our air-conditioned Dining Rooms; the extreme heat and humidity meant the All Camp Cookout turned into an All Camp Cook In. Hillard Dogs, carrots and celery, mixed green salad, Apple Juice and Lemonade and Fresh Fruit for dessert! We ended the day with a patriotic red, white and blue Firecracker Junior Iced Pop for refreshments . Speaking of food, the Hillard Menu is varied and delicious, offering a wide variety of tasty, well-balanced meals; hearty baked ziti with cheese, chicken nuggets with roasted potatoes, Mexi-Beef tacos with salsa, cheese and sour cream. And of course their is always a variety of healthy side dishes and desserts daily. Mixed green salad, tasty carrots and crispy celery, sliced cucumber and tomato salad, green beans and chick peas and a new addition in 2018, Hillard’s Homemade Hummus, sesame free, but creamy and delicious! And there is always tasty fresh fruit like orange and apple slices, watermelon and fruit salad for dessert! Sports League Teams have been formed, and inter-tribal games have begun, campers have all been assigned to Instructional Swim Groups, and on Friday we continued our summer tradition of Music at the Pools during the afternoon free swims. It has been an amazing first two weeks of camp fun, but we still have lots of special events to look forward to. Monday is Crazy Hat and and Hair Day; the Apache, Iroquois and CIT Boys and Girls can get psyched for trip to Playland on Tuesday; the boats are out of dry dock and are being shined and polished for Junior Camp Boat Rides and Middle and Senior Camp Boat Races; preparations are already in high gear for our Festival of Fun and our second Tribal Color Day on Wednesday; the Cherokee boys are gearing up for their Visiting Evening on Wednesday; and 6th year and more campers will enjoy a bountiful breakfast buffet and a special gift on Friday! All of this in addition to more marshmallow roasts, ice cream parties and more….Phewww! What an exciting week coming up! This entry was posted in Uncategorized on July 7, 2018 by Camp Hillard. Camp Hillard’s 90th Summer is Now Underway! Camp Hillard’s 90th Summer Season kicked off on Monday, June 25th. After a long, cold winter, campers and counselors and parents were thrilled that Opening Day was finally upon us! On Opening Day, campers and counselors got to know one another. As groups got off the bus, they were brought to their respective Tribal meeting areas where camper and counselor introductions were made. Tribes got to know each other’s names by playing all different types of Getting to Know You games. After putting things away in our bunks, we had a great first day of activities, including our first swim. A new addition to Hillard’s Lunch selections, Bosco Sticks with marinara sauce, was on the menu for all campers. Campers were curious and excited to try these delicious mozzarella-filled bread sticks and the end of day refreshment, a Twin-Pop, was truly delicious! Marshmallow Roasts began on Wednesday. Every group can look forward to one Marshmallow and one S’mores Roast over the summer, in addition to an Ice Cream Party. Friday was Wacky Socks Day. Campers and counselors wore their wildest, wackiest, funniest, fastest, most favorite socks….You get the idea! The Annual Camp Lollipop Hunt will take place on Monday. Campers can look forward to our Independence Day celebration on Tuesday, highlighted by an exciting Independence Day parade, an all-camp cookout, special refreshments, a visit from the Fire Department, and other special activities throughout the day. Camp is closed on Wednesday, July 4th. Happy Birthday, America! This entry was posted in Uncategorized on June 30, 2018 by Camp Hillard. It is hard to believe how quickly another summer has come and gone! Camp Hillard’s 89th summer was another successful season, full of fun, friends and really fabulous weather. This last week of Camp kicked off with a bang on Monday, with the Apache and Iroquois Visiting Evening performance. The boys and girls took to the stage in their production of Hairspray. They could not stop the beat, and what a production it was! The fun continued on Tuesday, with the annual Camp Hillard Carnival. This year’s Carnival theme was everything Disney; every group in Camp was responsible for creating a game booth with a Disney theme. Moana’s Maui Tattoos, Star Wars Shootout, and Pin the Tail on the Minion, just to name a few! There were exciting inflatables on the Main Field for campers to enjoy; a Candy Land obstacle course, the Goofy Gator and the Sea Fun House, and an Amusement park Obstacle Course. As an extra special sweet treat, every camper and counselor enjoyed one of the most popular refreshments of the summer; a sour, Lick-a-Color ice pop. It was a truly spectacular day from start to finish. On Wednesday, the Libman family was joined on stage by representatives from the Westchester Children’s Musuem for the presentation of a generous check of $14,583 to this worthwhile organization. Thank you to all the campers and counselors who participated in this year’s Charity Event. We also enjoyed a very special Camp show; where campers performed some popular tunes from their Visiting Day performance. Thursday was Camp Hillard’s 89th Birthday. Every camper and Counselor got to enjoy cake and punch, after lunch, in honor of this special day. August 17th was also Hillard Libman’s actual birthday; he would have turned 87 years old this year! Final Day Festivities on Friday included the traditional Moving Up Ceremony, where campers and counselors moved over or up to a different Tribal Assembly area. This is always an exciting event for the Huron boys and Girls, who will be moving out of Junior Camp, and the Comanche boys and girls, both moving up to Senior Camp. We enjoyed a delicious lunch of Chicken O’s, followed by an Ice Cream Sundae, before we gathered at the stage for one last time to give Special Recognition to counselors who really stood out this summer, followed by the ever-popular Counselor Talent Show. The Cheyenne Boys taught the crowd how to Wobble, Jessie from the Creative Arts Staff led the Leadership Team in an energetic Zumba workout, and the Theater Staff delivered a touching performance of Waving Through a Window from Dear Evan Hansen. It was a very entertaining and spirited display of talent! The 89th Summer was truly terrific. Camp Hillard is a special place, and a big part of what makes it so special is due in large part to that very special group of people, the Hillard Counselors. What they did this summer was very special. Our campers truly benefited from all of the care and attention they received from these dedicated and enthusiastic people. We will shortly begin the cycle again and start getting ready for Summer 2018. In the meantime, we wish all of you the very best for the rest of the summer and on into the school year. This entry was posted in Uncategorized on August 20, 2017 by Camp Hillard. Spirit Week Opening Ceremonies took place on Monday morning. Campers and counselors filed onto the Main Field, all of them broken out into Green and White Teams, to witness the raising of the Green and White flags as Jon Libman declared, “Let the games begin!” Green and White counselor representatives from every tribe participated into a spirited water balloon toss, as well as a Leap Frog competition! Competitions continued in earnest throughout the entire week; groups came together and broke out into their respective Green and White Teams for Track and Field events including the javelin throw, the broad jump and the shot put, as well as the 40 yard dash. Other Spirit Week events included running bases for time, dribbling and shooting competitions at basketball punt and pass competitions at football, mini-golf and tennis tournaments, the Thunderdome, as well as an intense Olympic Soccer tournament and water polo matches at the Pool. On Friday afternoon, the entire Camp assembled once again on the Main Field for our Spirit Week Ceremonies, which included an intense Leadership Team Relay that included a human wheelbarrow race, a piggy back sprint, and dizzy spins! vents, Campers cheered for their Divisional Head Counselors and their Divisional Swim and Sports Directors, all of whom were randomly selected for either the Green or White team, while enjoying their afternoon refreshments. When all of the events concluded and the scores were tallied, The Green Team was declared the Victors with 2,848 points. The scores couldn’t have been much closer; the White Team finished with 2,819 points! Regardless of the point totals, every camper was filled with a sense of Camp Spirit, pride, and accomplishment for their intense participation, great sportsmanship and Green and White pride! The eighth and final week of Camp is sure to be an exceptional four days of fun. The Big Show is on tap for Monday evening; the Apache and Iroquois Boys and Girls are ready to cut loose in their production of Hairspray. Final rehearsals have been in full gear, and the show is sure to be a fantastic one. Tuesday, the long awaited Hillard Carnival will commence. It’s also our final Tribal Color Day and an All Camp Picnic. The Special Camp Show and Charity Presentation are on Wednesday; campers are gearing up to take the stage to perform some of the most notable songs from their Visiting Day performances. The counselors have been furiously preparing for the Annual Counselor Talent Show on Friday, which is sure to be a lot of fun. On Friday, we will also have a Moving Up ceremony for all the campers as they step into the shoes of their future tribe; Pawnees to Chickasaws, Hurons to Cheyennes, and so forth! It is sure to be an exciting and memorable week. This entry was posted in Uncategorized on August 13, 2017 by Camp Hillard. Week 6, Week 6!!? It’s hard to believe just how quickly the summer is flying by. The week was highlighted by the Swim Festivals; Senior Camp on Monday, Junior Camp on Tuesday and Middle Camp on Friday. There was music at the pools, treasure hunts, swim races, musical water buckets and more! S’mores Roasts and Ice Cream Parties are in full swing. This week, the Pawnees, the Huron boys and girls, the Comanche boys and the Cherokee girls all enjoyed their ooey, gooey, sticky-delicious S’mores Roast, while the Cheyenne and Comanche girls, the Cherokee and INA boys and the INA girls enjoyed their Tribal Ice Cream Party. Nothing beats a Camp Hillard Ice Cream Party; campers build their very own Ice Cream Sundae, choosing two scoops of ice cream, chocolate or vanilla (or both), assorted tasty toppings like rainbow and chocolate sprinkles, caramel sauce or chocolate syrup and maraschino cherries. An Ice Cream Float is another option; two scoops of ice cream, swimming in fizzy, bubbly Coca Cola. A refreshingly tasty treat on a hot summer day! The week’s Lunch offerings were varied and delicious, as usual. We started the week with a Mexican Monday, Mexi-Beef Tacos with Cheese, salsa and sour cream. A Make Your Own Sandwich meal of assorted cold cuts, cheeses and french fries was on the Menu for Tuesday. Wednesday featured Hillard’s insanely popular Chicken O’s; most campers and counselors will admit to saying, “I’m just going to have one more.” But everyone knows you can never just eat one more Chicken O! Thursday featured Pasta Primavera with fresh veggies, and we rounded out the week with a Topsy Turvy Breakfast for lunch: French Toast Strips, Turkey Sausage Tater Tots and Chocolate Milk! This week, we also saw several nail-biting Sports League Playoff and Championship games. In the Comanche Boys Hudson River League, the Meatball Superheroes played the Golden Cheeseburgers while the Mac ‘n Cheese Smackers took on the Feisty Nuggets. The Meatball Superheroes and the Mac ‘n Cheese Smackers were victorious in the first round and played each other in the Hudson River League finals with The Meatball Superheroes claiming the title. The East River League saw the Lightning Os play the Alpha Dogs and the Oreos ‘n Milk take on the Thunder Nuggets. The Lightning Os and the Thunder Nuggets won their respective first round games and had an epic East River League finals matchup with the Lightning Os coming out on top. Additionally, Monday, Tuesday and Thursday saw real exciting and competitive play during the Cherokee Boys Sports League championship games; with the Cherokee Champs, Army Force 7, the Lunchtime Lays, and the Spaceouts placing 1st, 2nd, 3rd, and 4th respectively in their American Division Championship Games. While the Lightspeed Champions and Flaming Tigers placing 1st and 2nd in their National Division Championships. The INA Boys Sports League Playoffs began on Monday, with the championships held on Friday. The 2017 INA Boys Sports league Champions are Trilogy, followed by the Rippers, finishing in second and The Killer Moths in third place. Congratulations to all of the Sports League participants, who all demonstrated good sportsmanship and great Camp spirit. The Pawnees and the Chickasaw Boys and Girls had their Visiting Mornings early in the summer; for many of our youngest campers, Camp may be their first full-day group experience, and moms and dads are eager to meet the counselors and see their little ones in action! This year, the Pawnees and the Chickasaws showcased their developing athletic skills at a Sports Skills Showcase on the Main Field, participating in a mini-obstacle course which included shooting hoops, kicking a soccer ball and scoring a goal at field hockey. On the musical side of things, they performed a few special songs that they had been perfecting for the first few weeks of the summer, including Put On a Happy Face, You Are My Sunshine and the Camp Hillard song. The Visiting Day programs for Hurons and older are a little more intense; in addition to participating in sports and swimming, campers perform a Broadway style show on the big stage. This summer, the Huron Boys and Girls hit the stage for the very first time, performing The Lion King and Annie! Visiting Day for the Cheyenne Boys and Girls included baseball and softball and swimming at South Campus Pool Complex, which always includes a ride down The Great Green River! The Boys traveled travelled to Pride Rock to work on their roars in their production The Lion King and the Girls enjoyed performing in the well-loved, iconic musical, Annie. Comanches and older are always excited by the prospect of a Visiting Evening. These Tribes get to remain at Camp after every other camper has gotten on their bus and headed home! Dinner is served at South Campus and campers and counselors gear up for an exciting evening! The Comanche Boys and Girls showed off their athletic prowess during games of basketball and soccer, respectively, after which the boys hit the stage to perform All Shook Up, while the Girls entered a world full of adventure, in Disney’s classic, Beauty & the Beast. Visiting Evenings for Senior Camp take place towards the end of the summer; campers spend six to seven weeks rehearsing for some very exciting shows; the Cherokee and Navajo girls in Beautiful and Pitch Perfect and The Really Big Show during the final week of Camp. This year, the A-I Boys and Girls are welcoming in the 60’s in the Broadway hit, Hairspray! Next week, the fun continues! The excitement is building for the Opening Ceremonies of the first ever Green and White Spirit Week competition. The Opening ceremonies will include a Top Secret Counselor Event; the event is so secret that Directors Jon and Jim Libman are still not privy to the details. It is certain to be memorable! This entry was posted in Uncategorized on August 5, 2017 by Camp Hillard. The Westchester Children’s Museum, located in the North Bathhouse at Rye Playland is a light-filled, colorful, vibrant learning space filled with hands-on exhibits not found anywhere else in this region. Since the Museum opened in March 2016, more than 40,000 people have experienced the amazing exhibits the Museum has to offer in physics, science, art, technology, and design, with places to climb, build, and explore. It is a place where children lead the process of discovery and learning while adults share the experience through their child’s eyes. The Westchester Children’s Museum is seeking to expand its ability to provide a welcoming and enriching environment for as broad an audience as possible, in particular those who need it most in our undeserved communities. All campers donating at least $40 per camper will receive a very special thank you package. This package will include a Camp Hillard/Westchester Children’s Museum T-shirt as well as many other surprises. In addition, any camper donation of at least $100 per camper will entitle the camper’s family to participate in a raffle for a free summer for 2018. These donations must be made this summer during the fundraiser. The winner will be announced in the Winter Newsletter, and should the winner be someone who is not returning next year to Camp Hillard, they can give the award to a friend who is. This week was also highlighted by the Annual Iroquois Overnight to Brookwood in Glen Spey, New York. This annual trip is reserved solely for the oldest campers, the Iroquois, and the campers really look forward to it. We departed from Camp early on Tuesday morning, in order to get in a full day of fun at Brookwood! Lake activities were very popular with campers and counselors alike; everything from kayaking and paddle boating, to water tubing behind a speedboat and the Blob, a giant trampoline-like inflatable that campers could bounce up and down on, splash-landing into the refreshing lake. Speaking of food, can we talk for just a minute about the food at Camp Hillard? It really is pretty fabulous. A great deal of time and thought is put into the Menu planning prior to the Summer Camp Season. Some of the more popular lunch offerings include Hillard’s Famous Cheese Pizza, Nachos Grande with Cheese, crispy Chicken Nuggets, the insanely popular Chicken O’s (think a chicken nugget shaped like a donut), Mexi-Beef Tacos served with Salsa and Sour Cream, Asian-inspired Chicken with broccoli, to name just a few. In addition to the Daily Menu, a variety of substitutes are readily available so as to accommodate all camper’s tastes, preferences and dietary needs. Mid-day snacks and afternoon refreshments are also served daily; Goldfish, Graham Crackers, Oreos, and Kettle Cooked Potato Chips are among some of the daily snack options. Ice cream and iced pops are served on an alternating schedule in the afternoon; Twin Pops, Chocolate Eclairs, Firecracker Pops, Ice Cream sandwiches and more. There is no better way to end a busy Camp day than sitting down with friends and enjoying a cool and refreshing treat before boarding the bus to go home. Swim races, s’mores roasts and ice cream parties are scheduled for next week, and Thursday is Halloween In July; campers and counselors should come to Camp in costume, and be prepared for some Spooktacular Tricks and Treats! This entry was posted in Uncategorized on July 22, 2017 by Camp Hillard. On Thursday, campers who have been here for 6 or more years, celebrated with a special breakfast; pancakes, French toast sticks, tater tots, eggs and turkey sausage. They also received an extra special gift, a wireless Bluetooth speaker, emblazoned with the Camp Hillard logo! Wednesday was our Annual Festival of Fun. This year’s theme was the Wild West; Camp was transformed into a rooting-tooting, boot-stomping hoedown! Hillard Cowpokes and cowgirls got to enjoy some inflatable rides and attractions on the Main Field, as well as some Ride ‘Em Cowboy Relay Races, Boot Tossing and Steer Roping on the Upper Field. Everyone gathered at the Watering Hole for some tasty Barbeque grub. Yee haw! Senior camp boys and girls all had fun on Thursday with the Senior Camp boat races. The Performing Arts program is off to a great start! The Huron Girls are learning how to have fun “Under the Sea” in The Little Mermaid while the Huron and Cheyenne Boys are having fun pretending to be lions as they learn what it is like to be King of the Jungle in their show The Lion King. Watch out for their “roars!” The Cheyenne Girls are enjoying the songs from the classic musical Annie, while the Comanche Boys and the Cherokee Boys Theater Club are learning how to rock & roll in their show All Shook Up. The Comanche Girls are learning what is like to live in a world like their books, full of adventure, in Disney’s classic, Beauty & the Beast. Finally, in senior camp, the Cherokee Girls are learning about the amazing singer/songwriter, Carole King and her timeless music in Beautiful. In addition to that, the Navajo Girls are having an “Aca-mazing” time with their show Pitch Perfect. For the big show, the I-A girls as well as the INA Boys, are preparing to “Welcome in the 60’s” in the Broadway hit, Hairspray! Speaking of Visiting Days and Evenings, the Cherokee Boys enjoyed a very successful Visiting Evening on Wednesday.. While Visiting Days are always fun and exciting, there is something extra special about a Visiting Evening; campers get the opportunity to stay after camp has ended, where they get to enjoy a Tribe Dinner at South Campus before family and friends arrive for the evening program. The Cherokee boys showed off their progress at swim before hitting the courts and the hockey rink to showcase their athletic skills. The Comanche Boys are looking forward to another exciting visiting evening on Monday; they will be the first Tribe to hit the stage to perform for their family and friends. Our Annual Charity Event for the Westchester Children’s Museum begins on Monday. This entry was posted in Uncategorized on July 15, 2017 by Camp Hillard. The second week of Camp was just great! After a patriotic Four Day Weekend in honor of Independence Day, campers and counselors were anxious to get back into the Camp routine! On Wednesday, we had our annual lollipop hunt, divided by Division. Over the long holiday weekend, fireworks went off above the Upper Field, dropping lollipop seeds everywhere. When we arrived on Wednesday morning, campers discovered that lollipops had sprouted and we needed to collect them so we could play ball again! Freshly picked lollipops always taste the best!!!! Campers collected and sorted the lollipops into colors, receiving points for the most pops collected. Congratulations to the Cheyenne B boys, Cheyenne A girls, Comanche C boys, Comanche A girls, Cherokee A boys, Cherokee A girls, Iroquois Girls and Navajo Boys for being the best lollipop pickers in camp. As a reward they will each receive a super yummy S’mores Roast!!!! 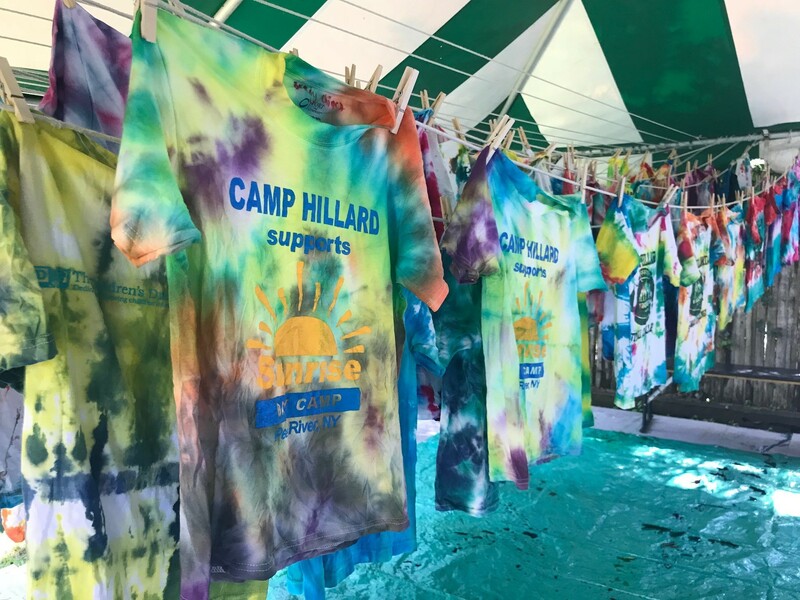 On Wednesday, July 5th, all our 2nd year campers received the traditional Camp Hillard banner, and on Thursday, July 6th, 3rd and 4th year campers received their specially designed and highly coveted t-shirts! Camp Picture Day also took place on Thursday; campers and counselors sported the traditional white Camp Hillard shirt and their best and brightest smile for their Group Pictures. The Apache, Iroquois and CIT boys and girls embarked on a fun-filled trip to Playland on Thursday, July 7th, where they enjoyed various rides and attractions and games of skill of chance. The overcast, drizzly weather was actually a hit rather than a hindrance; smaller crowds, shorter lines, more fun! On Friday we continued our summer tradition of Music at the Pools during the afternoon free swims. Marshmallow Roasts continued with the INA boys and the Chickasaw and Huron girls this past Wednesday. It was a very messy, but delicious affair. The Chickasaws followed suit on Thursday and they really showed us how to really get messy!!!!! It has been an amazing first two weeks of camp fun, but we still have lots of special events to look forward to. On Monday, the Navajo and Apache Boys and Girls are travelling to Powerhouse Studios where they will participate in a Wacky and Wild Game Show; 5th year campers can get psyched for their Ice Cream Party on Tuesday; the boats are out of dry dock and are being shined and polished for Junior Camp Boat Rides and Middle and Senior Camp Boat Races; preparations are already in high gear for our Festival of Fun and our second Tribal Color Day on Wednesday; the Cherokee boys are gearing up for their Visiting Evening on Wednesday; and 6th year and more campers will enjoy a bountiful breakfast buffet and a special gift on Thursday! All of this in addition to more marshmallow roasts, ice cream parties and more….Phewww! What an exciting week coming up! This entry was posted in Uncategorized on July 8, 2017 by Camp Hillard. Camp Hillard’s 89th Summer is Now Underway! Camp Hillard’s 89th Summer Season kicked off on Monday, June 26th. After a long, cold winter, campers and counselors and parents were thrilled that Opening Day was finally upon us! On Opening Day, campers and counselors got to know one another. As groups got off the bus, they were brought to their respective Tribal meeting areas where camper and counselor introductions were made. Tribes got to know each other’s names by playing all different types of Getting To Know You games. After putting things away in our bunks, we had a great first day of activities including our first swim. Camp Hillard’s famous pizza was on the menu for all campers, and the end of day refreshment, a Twin-Pop, was truly delicious! • Campers being assigned to their swim instruction groups. • Exciting sports instruction and games. • Many groups had their first arts and/or other specialty activities. • Tuesday was our first Tribal Color Day. Camp was awash in a sea of colors as campers and counselors alike were decked out in their special colored t-shirt. • Marshmallow Roasts began on Wednesday. • Our Independence Day celebration on Friday was highlighted by an exciting Independence Day parade, an all-camp cookout, special refreshments, a visit from the Fire Department, and other special activities throughout the day. • The Annual Camp Lollipop Hunt will take place on Wednesday; 2nd Year Campers will receive their Camp Hillard banners on Tuesday. • On Thursday, our 3rd and 4th Year Campers will receive their special T-shirts. • Thursday is also our Camp Pictures day. All groups will have their group picture taken. We ask that all campers wear their white Camp Hillard T with the green logo. • Some tribes are also scheduled for their Marshmallow Roasts. • On Thursday, the Apache and Iroquois Boys and Girls and the CIT’s will visit Playland Amusement Park in Rye. We hope everyone has a safe, healthy, happy, festive 4th of July Holiday! We can’t wait to see everyone on Wednesday!happy, festive 4th of July Holiday! We can’t wait to see everyone on Wednesday! This entry was posted in Uncategorized on July 2, 2017 by Camp Hillard. Olympic competitions continued in earnest throughout the entire week; groups came together and broke out into their respective countries for Track and Field events including the javelin throw, the broad jump and the shot put, as well as the 40 yard dash. Other Olympic events included running bases for time, dribbling and shooting competitions at basketball punt and pass competitions at football, mini-golf and tennis tournaments, as well as an intense Olympic Soccer tournament and water polo matches at the Pool. On Wednesday, the entire camp wore their tribal color shirt and some even added some tribal color accessories, and we all met on the Main Field for a colorful All Camp Assembly – it looked fabulous! On Wednesday evening the Navajo girls had their visiting evening. The girls did a great job showing off their swimming skills and did a BEAUTIFUL job on stage performing their show. Thursday was Crazy Hat/Hair Day!! Campers and counselor showed off their creative sides, displaying a dizzying array of whimsical and colorful hairstyles; mohawks and faux-hawks, dreadlocks and boxbraids and unicorn horns; not to mention a wide variety of crazy hats including Viking horns, hotdogs and hamburgers, bunny ears and cat ears, and giant Dr. Seuss hats, minus the cats, of course! It was great to see such an expression of spirit all throughout camp! Campers continued to work on their American Red Cross swimming skills and are making great progress. In addition to our regular swim program, Junior Campers participated in Olympic Swim Fun, complete with Medal Hunts, swim races and “silly’ jumps! On Friday afternoon, the entire Camp assembled once again on the Main Field for our Olympic Closing Ceremonies, which included some intense counselor events, including a 40 yard dash and a football toss. Six counselors from each tribe were chosen at random to represent each of the six Olympic countries participating; Brazil, England, France, Greece, Israel, and Mexico. Campers cheered for their respective country, while enjoying their afternoon refreshments, and when all of the events concluded and the medal counts tallied, England was the Gold Medal winner, followed by Greece, who took home the Silver and France with the Bronze. Congratulations to all our participants!! The eighth and final week of Camp is sure to be an exceptional four days of fun. The Big Show is on tap for Monday evening; the Apache and Iroquois Boys and Girls are ready to cut loose in the 10th Anniversary production of High School Musical. Final rehearsals have been in full gear, and the show is sure to be a fantastic one. Wednesday, the long awaited Hillard Carnival will commence. It’s also our final Tribal Color Day and an All Camp Picnic. The Special Camp Show and Charity Presentation are on Tuesday; campers are gearing up to take the stage to perform some of the most notable songs from their Visiting Day performances. The counselors have been furiously preparing for the Annual Counselor Talent Show on Thursday, which is sure to be a lot of fun. On Thursday, we will also have a Moving Up ceremony for all the campers as they step into the shoes of their future tribe; Pawnees to Chickasaws, Hurons to Cheyennes, and so forth! It is sure to be an exciting and memorable week. This entry was posted in Uncategorized on August 16, 2016 by Camp Hillard. Week 6, Week 6!!? It’s hard to believe just how quickly the summer is flying by. The week was highlighted by the Swim Festivals; Senior Camp on Monday, Junior Camp on Tuesday and Middle Camp on Wednesday. There was music at the pools, treasure hunts, swim races, musical water buckets and more! On Monday evening, the INA boys and girls took part in the annual tradition known as INA night, a spirited competition between Green and Gray. The boys competed on the baseball diamond, the soccer field and the gridiron, while the girls participated in the Apache Relay. The competition was friendly but fierce, with the gray team edging out the green team by only 100 points! On Friday, the entire Camp assembled in Olympic Stadium, (usually known as The Main Field) for our Olympic Opening Ceremonies. Everyone, campers are counselors alike, was randomly assigned to one of six countries; Brazil, England, France, Greece, Israel, or Mexico; and after Morning Assembly, we filed into Olympic Stadium behind our Country’s Flag Bearer, to the tune of every country’s National Anthem. The Olympic Flag was raised, the Olympic Oath was recited, the Olympic Flame was raised and the Games were declared officially Open. The first day of events included an Olympic Soccer tournament, which saw medals awarded to England, Greece and France; gold, silver and bronze, respectively. An entire week of Olympic competition continues all next week! The week’s Lunch offerings were varied and delicious, as usual. We started the week with a Mexican Monday, Mexi-Beef Tacos with Cheese, salsa and sour cream. A Make Your Own Sandwich meal of assorted cold cuts, cheeses and french fries was on the Menu for Tuesday. Wednesday featured Hillard’s insanely popular Chicken O’s; most campers and counselors will admit to saying, “I’m just going to have one more.” But everyone knows you can never just eat one more Chicken O! Thursday featured one of the more highly anticipated lunches of the summer, Sloppy Joes, prepared with lean ground turkey and served with sweet potato fries. We rounded out the week with warm and cheesy macaroni and cheese on Friday. This week, we also saw several nail-biting Sports League Playoff and Championship games. On Tuesday, the Comanche Boys kicked off the first round of their Divisional Playoffs. In the American Division the Hillard Scorpions played the Comanche Crushers and the Lightning Strikes took on the Eight Crushers. The Hillard Scorpions and the Eight Crushers were victorious and played each other in the American Division finals with the Eight Crushers claiming the title! The National Division saw the Blue Strawberries play the Eagles and the Wrecking Balls took on the Rockets. The Eagles and the Wrecking Balls won these matchups and had an epic finals matchup with the Wrecking Balls coming out on top. The Cheyenne Boys continued the playoff action on Wednesday; in the American Division, the Other Guys played the MonStars and the Fire Bombers took on the Golden Hamburgers. The Other Guys and the Fire Bombers were victorious in the first round and played each other in the American League finals, with The Other Guys claiming the title. The National League saw the Golden Retrievers play the Camp Hillard Heroes and the Super Ballers took on the Scorpions. The Camp Hillard Heroes and the Super Ballers won their respective first round games and had an epic National League finals matchup with the Super Ballers coming out on top. The Pawnees and the Chickasaw Boys and Girls had their Visiting Mornings early in the summer; for many of our youngest campers, Camp may be their first full-day group experience, and moms and dads are eager to meet the counselors and see their little ones in action! This year, the Pawnees and the Chickasaws showcased their developing athletic skills at a Sports Skills Showcase on the Main Field, participating in a mini-obstacle course which included shooting hoops, kicking a soccer ball and scoring a goal at field hockey. On the musical side of things, they performed a few special songs that they had been perfecting for the first few weeks of the summer, including songs from The Jungle Book and the Camp Hillard song. The Visiting Day programs for Hurons and older are a little more intense; in addition to participating in sports and swimming, campers perform a Broadway style show on the big stage. This summer, the Huron Boys and Girls hit the stage for the very first time, performing Peter Pan and The Little Mermaid! Visiting Day for the Cheyenne Boys and Girls included baseball and softball and swimming at South Campus Pool Complex, which always includes a ride down The Great Green River! The Boys traveled to Neverland in their production of J.M Barre’s classic, Peter Pan and the Girls travelled under the sea in their performance of The Little Mermaid! Comanches and older are always excited by the prospect of a Visiting Evening. These Tribes get to remain at Camp after every other camper has gotten on their bus and headed home! Dinner is served at South Campus and campers and counselors gear up for an exciting evening! The Comanche Boys and Girls showed off their athletic prowess during games of basketball and soccer, respectively, after which the boys hit the stage to perform The Blues Brothers, while the girls were Aca-Amazing in their performance of Pitch Perfect. Visiting Evenings for Senior Camp take place towards the end of the summer; campers spend six to seven weeks rehearsing for some very exciting shows; the Cherokee and Navajo girls in Beautiful and the and The Really Big Show during the final week of Camp. This year, A-I Boys and Girls and the Cherokee Boys Theater Club are starring in the 10th Anniversary Celebration of High School Musical. Next week, the fun continues! Olympic Competition continues in earnest, in addition to the Junior Camp Olympic Swim Fun and the Middle and Senior Camp Crazy Dive Contests. Thursday is Crazy Hat/Hair Day; everyone is looking forward to getting all wild and crazy! This entry was posted in Uncategorized on August 6, 2016 by Camp Hillard. The boys and girls departed for their mini-sleepaway to Camp Pontiac on Sunday morning, and they had an amazing time! Water front activities, including banana boating, kayaking and the brand new Tarzan Swing were a big hit with campers and counselors alike. The boys and girls also enjoyed arts and crafts, cooking, dance and woodshop. The food at Camp Pontiac was varied and delicious; multiple salad bars, pasta, grilled chicken, homemade, thin-crust pizza hand-fired in state of the art pizza ovens, in addition to afternoon snack offerings and evening trips to the Canteen or the Ice Cream Shop. A particularly cool aspect of Camp Pontiac’s Canteen, The Pont Roc Cafe, is that it is a stylized version of the Hard Rock Cafe! One particularly special highlight of the trip was an Overnight Sleepout in Tree Top Village for both the boys and the girls. This sleepout was a great opportunity for team building and bonding, as well as for a mini-prank war between the boys and the girls. When the Pontiac Shuttle buses returned to Hillard, the everyone chattered excitedly about their experience, and they are all looking forward to visiting again next summer. But everyone was really excited to be back home at Hillard, just in time for the Beach Dance Party in the Gymnastics Pavilion and the Cruise Ship through the Islands in The Creative Art Center! Speaking Beach Party Day; during the fifth week of Camp every summer, we celebrate a different special event. Everyone know that the regularly scheduled programming at Camp Hillard is unparalleled, but every once in a while, we like to switch thing up a bit and add something special. In summers past, we have celebrated Halloween in July, complete with spooky costumes and trick or treating; International Day, when we celebrate different cultures and customs from around the world; and this summer, DJ Joe spun the hits on the turntables for our Beach Dance Party, complete with colorful leis and grass skirts, a Limbo Contest, and a Tropical Snack; refreshing Pink Lemonade and Pretzel Goldfish. A Cruise Ship to the Islands embarked from The Creative Arts Center, and campers and counselors enjoyed a relaxing excursion to a variety of Tropic Locales, including the West Indies and the Hawaiian Islands. Tropical Tribal Games, including nautical relay Races and steamy Scavenger Hunts were also on the Itinerary+ for the day, which concluded with an extra special afternoon refreshment; a Banana Chocolate Rocket Pop! The INA Boys and Girls Night will take place on Monday night. The INA boys and girls eagerly anticipate this Annual Evening Event, a Hillard tradition, that includes spirited competition between the Green and Gray teams known as the Apache Relay. The INA girls can look forward to some more wintry fun on Wednesday when they travel to the Playland for an ice skating trip. Our Visiting Day and Evening Programs continue with Cheyenne Boys and Girls and the Cherokee Girls scheduled for next week. This entry was posted in Uncategorized on July 30, 2016 by Camp Hillard.